Last week I was trawling through my instagram feed (as I do so much more than I care to admit) and up comes this picture of the most amazing hotcakes I’ve ever seen. They we’re big and fluffy, sitting on a bed of Nutella (it literally looked like the plate was lathered in half a tub of the stuff), topped with some sort of cream and finished off with fairy floss. Queue the drool people, they looked ahhhhmayzing. In that instant I knew I had to visit the place that had created such a devilish dish and taste it for myself. To my surprise the masters behind this dish were from 5 Lire, a little café on Errol Street (directly across the road from the Auction Rooms) which has been on my list of places to visit for months, but for what ever reason I haven’t had a chance to go. 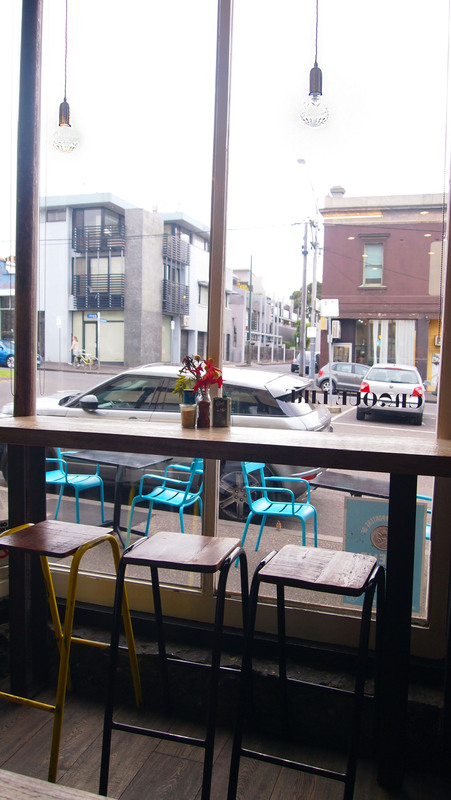 Well, upon the discovery of these hotcakes that changed quick smart and I made a bee line for North Melbourne. 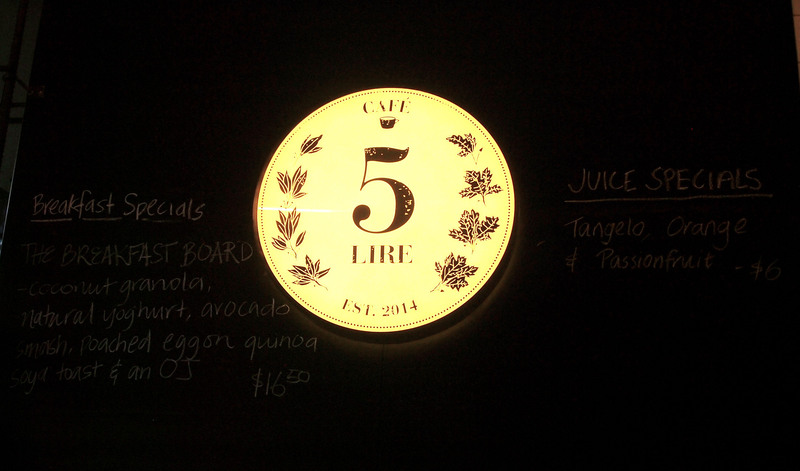 5 Lire isn’t the biggest café, but what it lacks in size, it makes up in soul. Full of timber detail and industrial fittings, it has a really rustic and welcoming feel to it. You can’t help but feel as home as soon as you walk in. We arrived at about 2.45pm on a Saturday afternoon, and although it was near closing time, the staff were really friendly and accommodating after what I’m sure had been a long day for them. I had a look at the menu just to be polite, but lets be honest, I was looking for those hotcakes. So surprise, surprise, I ordered the ricotta hotcakes (buttermilk hotcakes topped with Nutella inspired semifreddo, Pariya Persian chocolate fairy floss and scattered with The Wild Chocolate Cacao & Orange Crumble) and so that we could taste a second dish, I made my sister (under a fair amount of duress, she also wanted the hotcakes and who wouldn’t!) 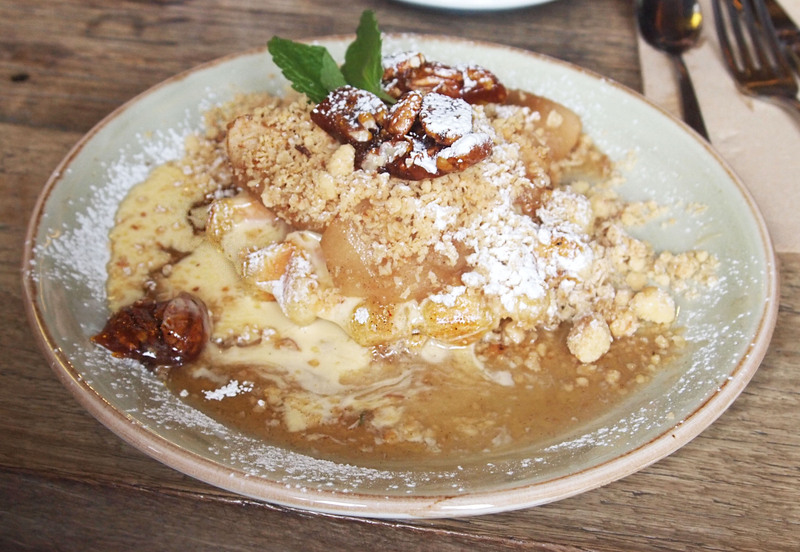 order the waffles (Waffle Jolie topped with a spiced apple short cake crumble, candied pecans and crème anglaise) . The hotcakes tasted just as decadent as they looked. 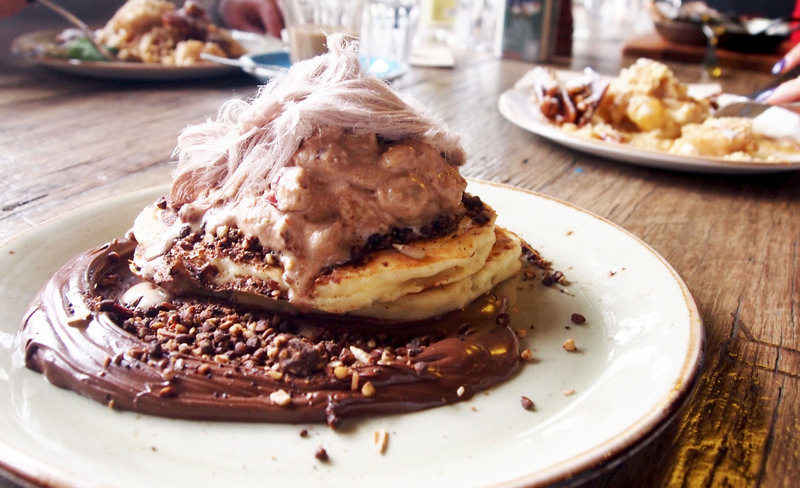 The hotcakes themselves were really fluffy and worked really well with the semifreddo which was chocolatey and packed full of hazelnuts. Then came the Nutella. There was so much Nutella on the plate, dare I say it, but it was almost, not completely, but almost too much. Never would this Nutella lover ever let it go to waste, but in the end I had to admit defeat and leave some behind. This is an insanely rich dish, but if you’re a lover of all things sweet it’ll be right up your alley. The waffles weren’t the most photogenic dish, but according to my sister they were “legit, heaven on a plate”. The waffles were soft, but at the same time crispy and worked perfectly as a base to the apple crumble. The crumble it self was absolutely divine! Definitely the hero of this dish. I’m so glad that I finally got a chance to experience the pure bliss that is 5 Lire. If I have one piece of advice, it’s don’t wait as long as I did to visit, those hotcake are one for the record books.